You know what is fun? Practical jokes. You know what is even more fun? 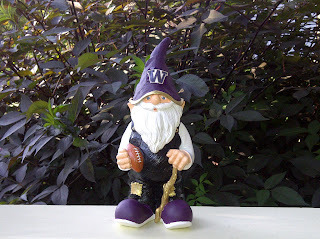 Practical jokes combined with crafting combined with my favorite sports team ever, the UW Huskies. 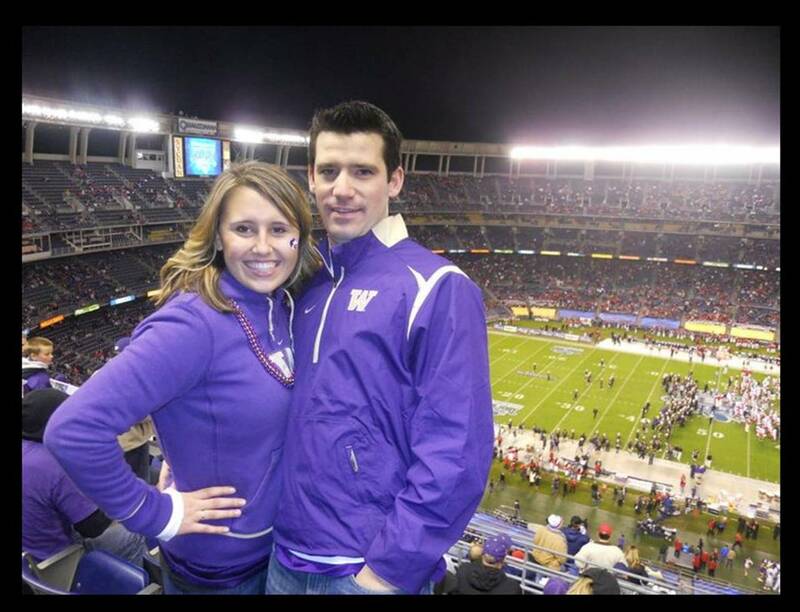 I'm assuming I've talked about our undying love for the Huskies before. No? Well, if I have, I forgot. If I haven't, I can't believe I've been blogging for 4 months without any mention of the Huskies. To clarify, we love the Huskies. Love love love. There is a good chance we will name our unborn children after Husky players (seriously). If we could have another wedding we may do it in purple and gold (not seriously, but wouldn't that be funny). We have (seriously) contemplated getting a Husky dog. Bottom line. We love the Huskies. OK. moving on. So a while back we had our friends over for dinner. 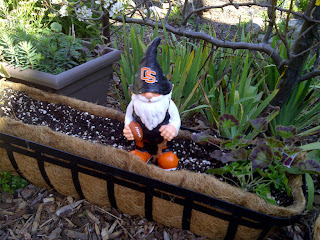 Unfortunately for them, they are Oregon State Beaver fans (we try not to hold it against them). 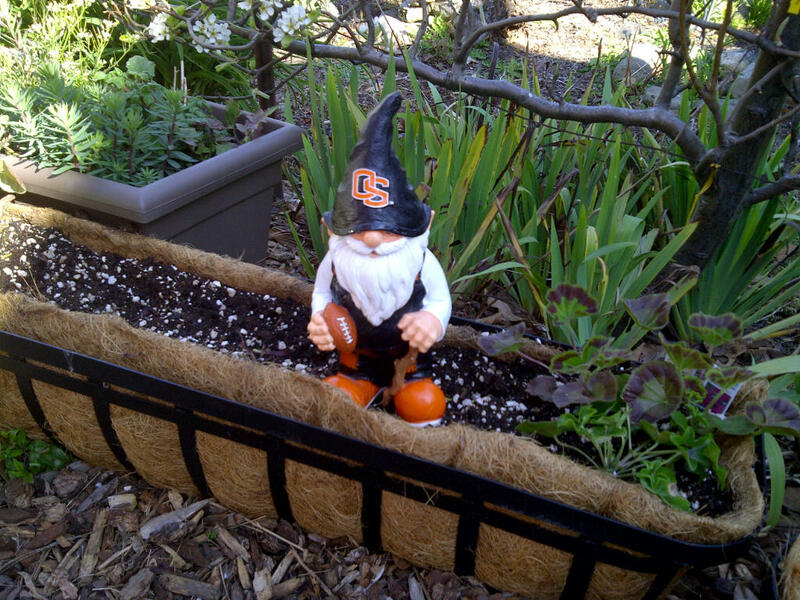 When they came over, they thought it would be funny to plant some OSU paraphernalia at our house and see how long it took us to notice. We found it right away (partially because they told Chris they hid something in our front yard) and we immediately started devising our plan of how to get them back. Chris was thinking of all the ways we could torture this poor little gnome while photographing it to send to them. I on the other hand starting think of craft paints. I told Chris we should paint him in Husky colors and then plant him at their house. Of course he loved my plan (partially since it didn't involve him having to paint anything), and he liked the idea of getting anything with OSU on it out of our house fast. 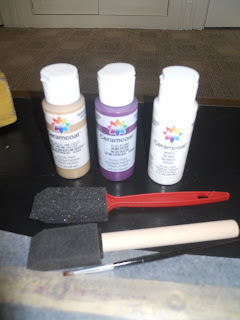 So I went and bought some purple and gold craft paint (it wasn't on sale, I didn't have a coupon and I was displeased- but some things are worth paying full price for). I was too cheap to buy new brushes, so I found some random brushes in the basement that were left by the old homeowners and figured they would do the trick. I kind of went a bit overboard and painted like7 coats on him, then even modge-podged a UW tattoo onto his hat. I was so proud of my amazing handi-work that I did a little happy dance (I've told you about this before, if you still haven't seen it, you are truly missing out).I couldn't wait to show it off, but I had to keep it a secret so our friends wouldn't see it. I call him 'Old-man Husky"
I kind of wanted to keep him for our house now that he was so perfect in his purple and gold outfit, but I knew he needed to head back to our friends' house. So when we went to Idaho 2 weekends ago, we packed this little guy up with us and Chris hid him in their garden. I fully expect this will become a new tradition of re-painting and hiding on each visit back and forth. I doubt that they can paint him better than I did (which I feel was a pretty professional job), but they can try. Hmmmm. Sounds like a challenge to me. Do you hear me Christie??? If you come to my house, please feel free to hide your own gnome. And be warned that when I come to yours, you just may find an Old-man-Husky of your own hiding in your garden.